ISLAMABAD:An amendment bill clearing the way for the merger of Federally Administered Tribal Areas (FATA) with Khyber Pakhtunkhwa (KP) was passed in the National Assembly on Thursday, a day after the parliamentary committee gave it a go-ahead. Voting on each clause of the bill was concluded in the afternoon.The bill requiredtwo-third majority to be passed. Prime Minister Shahid Khaqan Abbasi, while addressing the NA session after the bill was passed said that a committee worked for over two years and presented a report that had led to the constitution of the FATA implementation committee. “The committee report was assessed by civil and military leadership including the army chief,” he said, adding that the bill was approved with a consensus of the government and opposition members. “I am thankful especially to Khursheed Shah, Shah Mehmood Qureshi, and Farooq Sattar,” he said. The treasury and opposition benches came together to jointly pass the bill, he said. “We needed a national consensus, which was needed and visible,” Abbasi remarked. After the bill was passed by the lower house of the Parliament, PTI Chairman Imran Khan said the bill’s approval was a great victory for the country. While addressing the NA session, he said the coming time would tell that it was the right step to take. “There was a huge gap in the tribal areas which the enemy could have benefited from. The vacuum in FATA has now been filled,” said Imran. Congratulating the members of the house, Imran clarified that his party had represented the public in its stance on the merger of FATA-KP. 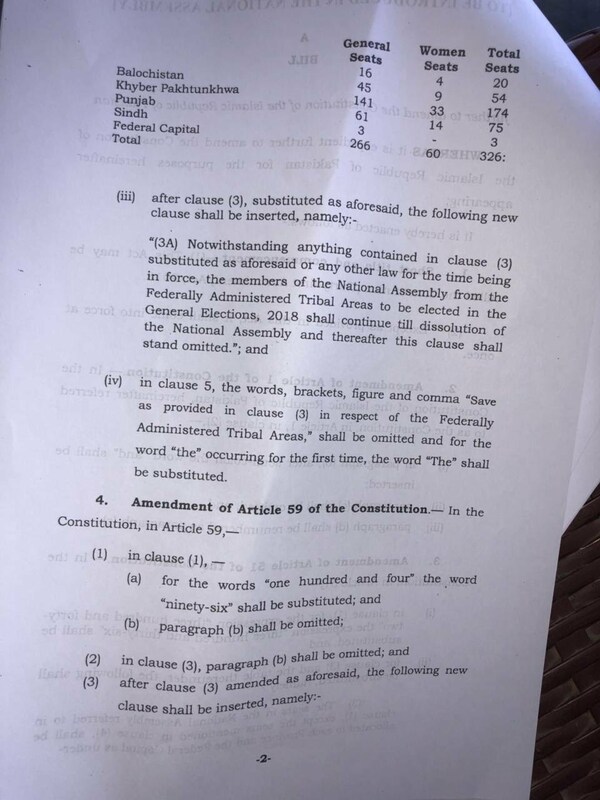 As NA Speaker Sardar Ayaz Sadiq had earlier called for voting on the clauses of the bill, 229 lawmakers voted in favour of the first clause while 11 opposed it. Meanwhile, the second clause was favoured by 229 lawmakers and opposed by three. 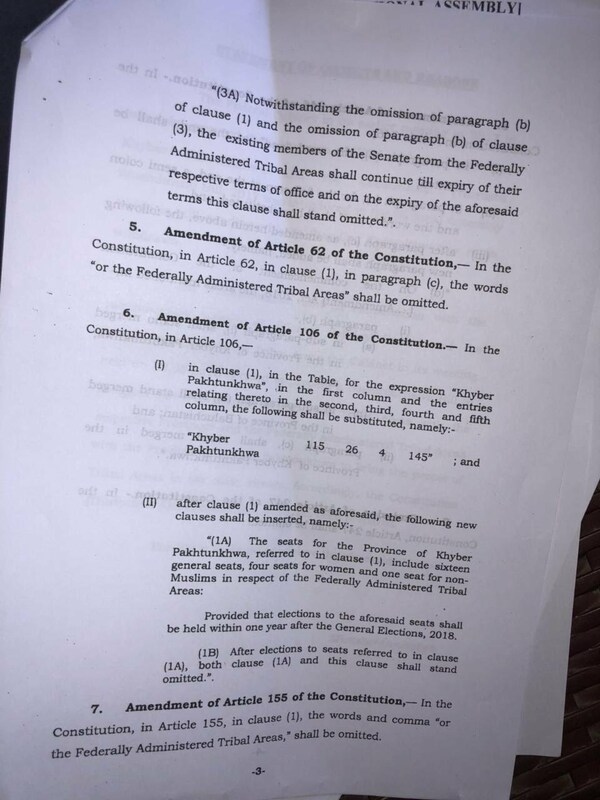 According to Geo News, there was an error in one of the clauses in the bill which was then amended by Pakistan Muslim League-Nawaz (PML-N) leader Zahid Hamid and approved. “The seats for women in KP and Punjab Assembly have increased from 9 seats to 10,” Hamid explained while making the change. 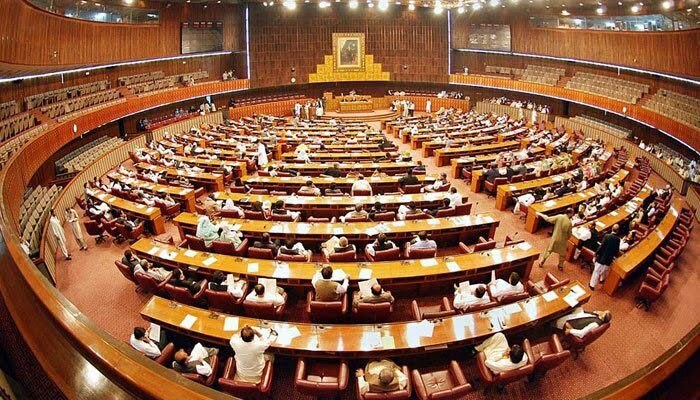 Jamiat Ulema-e-Islam-Fazal (JUI-F) and Pakhtunkhwa Milli Awami Party (PkMAP) members had staged a walkout from the assembly when voting on clauses had started. 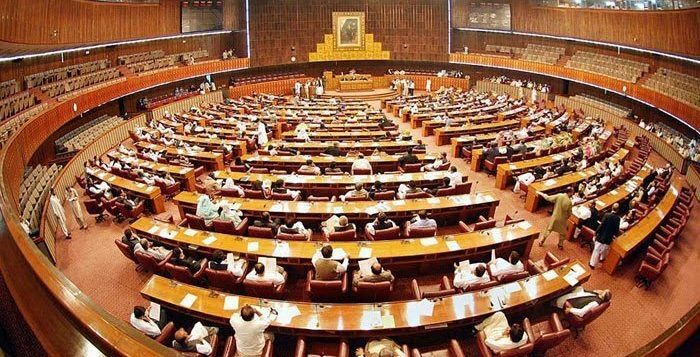 After months of delays following disagreements between coalition partners and the opposition over its clauses, the bill on the 31st Amendment of the Constitution was tabled by Law Minister Chaudhry Mehmood Bashir Virk. JUI-F and PkMAP opposed the bill when it was tabled while Muttahida Qaumi Movement (MQM) announced its support after expressing reservations. The NA Speaker was chairing the 56th NA session, attended byPrime Minister Shahid Khaqan Abbasi. 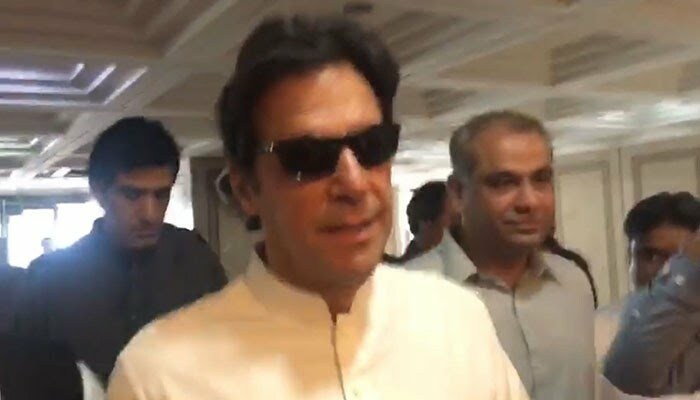 In a rare move, Pakistan Tehreek-e-Insaf chairman Imran Khan had also attended the session to vote for FATA’s merger with KP. “The bill aims at changing the 150-year-old system in tribal areas,” the premier had added. The House had earlier waited for more lawmakers to arrive before the bill was passed as while the government lacked attendance, the opposition was in full strength. The House was in order despite JUI-F MNA Maulana Jamaluddin pointing out quorum. The session was attended by Barrister Zafarullah, Senate Opposition leader Sherry Rehman, Pakistan Tehreek-e-Insaf leader Shah Mehmood Qureshi, and Aftab Sherpao. Jamiat Ulema-e-Islam-Fazl and Pakhtunkhwa Milli Awami Party members boycotted the session. 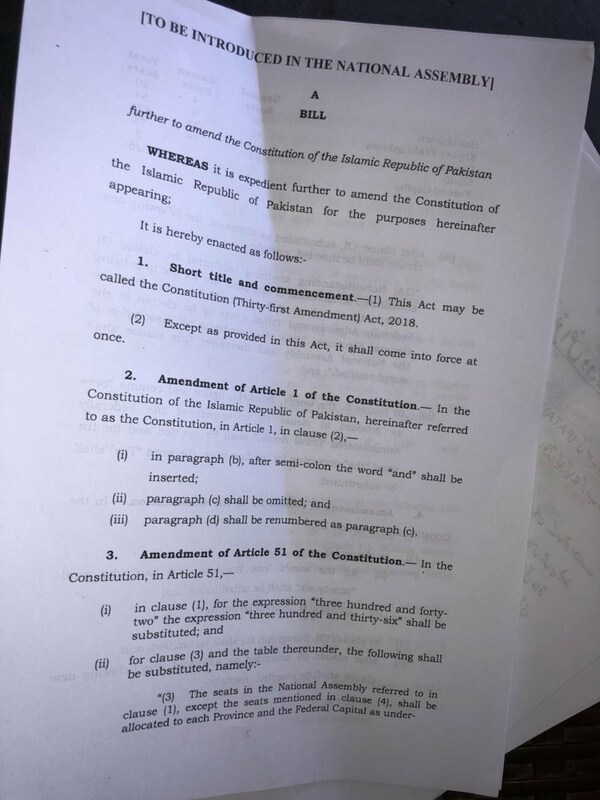 The draft bill seeks to amend seven articles in the Constitution of Pakistan to allow implementation of proposed reforms. 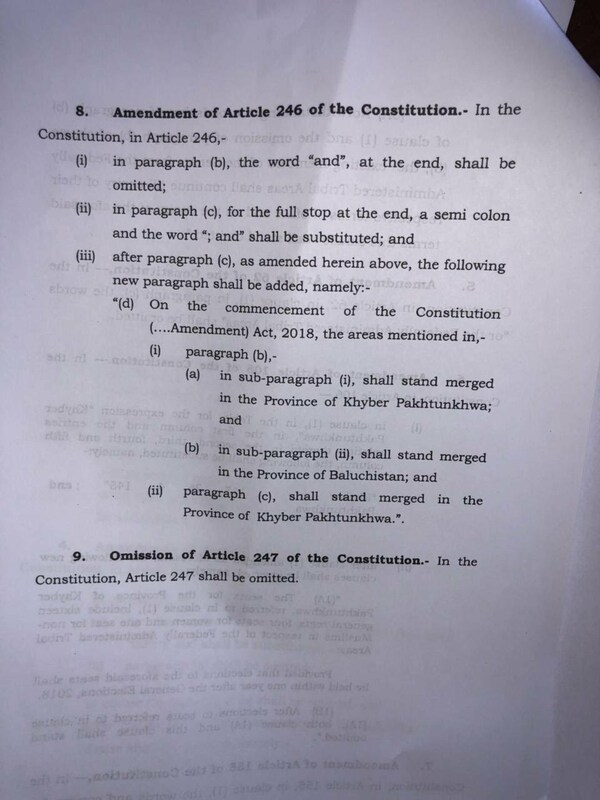 The bill also seeks to increase the number seats for the Khyber Pakhtunkhwa assembly to 147 from the current 126. The general seats of the provincial assembly will increase from 99 to 117, the bill states. Moreover, the seats for women will be increased from 22 to 26, while religious minorities’ seats will increase from three to four. 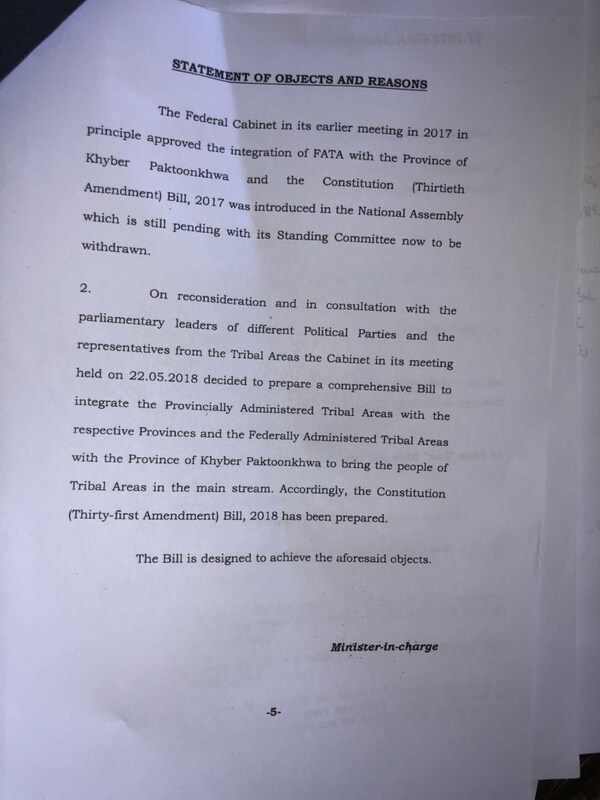 According to the sub-section of the bill, FATA will be granted 18 general seats, four seats for women and one for religious minorities. Moreover, FATA’s 12 seats in National Assembly will be merged in KP Assembly and KP seats will increase from 48 to 60 in the National Assembly.